The father of a Univesity of Iowa student who has been missing for almost a month has said she is “very spiritual” and regularly turns to God in prayer when things aren’t going well. Rob Tibbetts, the father of 20-year-old Mollie Tibbetts, also said that he feels the power of all the prayers being poured out for his daughter’s safe return. “Mollie’s very spiritual, and so is her brother Scott and so we talked about that quite a bit,” Tibbetts told Fox News at the weekend. On Sunday evening, friends and family of the missing student attended a prayer service at Corpus Christi Catholic Church in Piedmont, Oakland, where Mollie’s family used to live, according to ABC 7. “Our class had 30 kids, so everyone was like a family, everyone knew each other,” said Sam Szuhaj who attended elementary school with Mollie at Corpus Christi School. “She was very inclusive with everyone, just one of the most kind people in the class,” added schoolmate, Hannah Murray. Over a hundred former classmates, teachers and family friends showed up to the prayer service, which was led by Pastor Leo Edgery. “We still care about her and we still are thinking of her and wanting the best for her,” said former classmate, Emilie Naughtan. Kathleen Boyle, who organized Sunday’s prayer service, said that if the group were living in Brooklyn, they would be heavily involved in the search for their old friend. “If we lived in Iowa, we’d be searching the corn fields with her family or making meals for the volunteers, but all we can really do is share on social media, pray and just keep the story going,” Boyle told ABC 7. 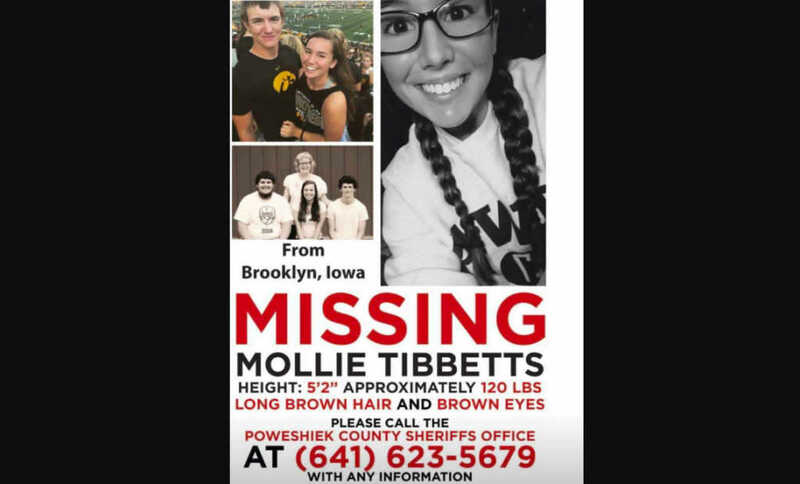 Mollie disappeared from the town of Brooklyn, Iowa on the evening of July 18 after going out for a jog. Despite conducting hundreds of interviews, authorities are still no closer to locating the young woman. In the wake of her disappearance, much has been shared online regarding her Christian faith. A 2016 video of the then-18-year-old sharing how prayer has impacted her life was shared on social media earlier this month by Tibbetts’ aunt, Billie Jo Calderwood, and offers a powerful glimpse into the private faith of this young woman. Speaking at a faith event at her high school, Tibbetts describes the first time she cried out to God in prayer. During a particularly trying cross country season, the student athlete experienced difficulty with her breathing that left her feeling “really weak” and not able to compete in two meets. This physical struggle gave way to anxiety and fear that eventually prompted her to seek heavenly help. At the next meet, she went on to run her best time thus far that season. Tibbetts said that she believes the Lord used that moment to demonstrate His faithfulness and care for her. “In that moment, I kind of knew that that was God’s way of showing me that the power of prayer was really something,” she said. Tibbetts acknowledged that the story may seem insignificant to others, but she knows that God used that experience to speak to her in a way that touched her personally. “What your testimony is, is showing everyone the strength that God has given you,” she said. In the wake of her sudden disappearance, Tibbetts’s confident words about the power of prayer offer some insight into her confident reliance on the Almighty, and her desire for others to do the same. A press conference with updates on the investigation is due to take place Monday 13th August. Please continue to pray for Tibbetts’s safe return.